Staunton insists: "I'm the boss!" New Republic of Ireland manager Steve Staunton believes working alongside Bobby Robson will compensate for his own lack of experience but made it clear: "I'm the boss!" Staunton, Robson and the backroom team of Kevin MacDonald and Alan Kelly were introduced to the media by the FAI at a press conference at Dublin's Mansion House this morning. Dundalk man Staunton, who will take charge with Robson acting as International Football Consultant, was appointed to replace Brian Kerr, whose contract was not renewed by the Football Association of Ireland following failure to qualify for the World Cup. 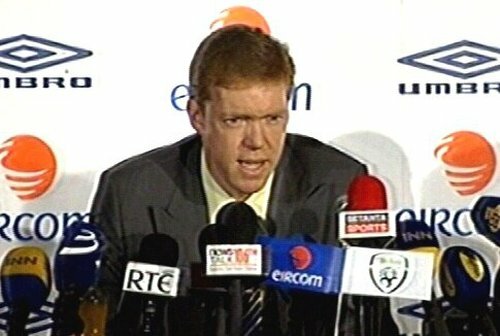 Former Republic captain Staunton realises the pressure he is under to qualify for the 2008 European Championships but insisted his position would not be undermined by the presence of former England boss Robson. He stated: "I'm the boss. I'm the gaffer. At the end of the day what I say goes, the buck stops with me. I will use Bobby in whatever role I see fit. He has a huge role to play, he's there for me all the time. I've got a very good coach alongside me (Kevin MacDonald) and I will put my trust and faith in him and that is why I got this team together." He continued: "I know in my heart we can do it and work together. We are here to achieve success, our aim is to qualify for the European Championships and World Cups. First and foremost that is our aim, we want to blood new talent and we have got new talent coming through. "We have to get the team up and running again, get the fans behind us and to give hope to the fans and show them we are heading in the right direction."